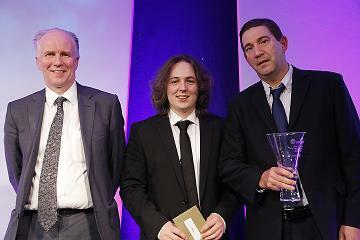 Alistair Smith, an Engineer from Strathclyde University won a special award at the ‘Young Software Engineer of the Year’ awards earlier this month. ScotlandIS, the trade body for Scotland’s information and communications (ICT) industry, presented the talented student with the Amor Group award. This is a special prize given to the project, which according to the judges most clearly maintains software engineering principles. Amor Group is Scotland’s dominant independent specialist provider of expert business consultancy and IT solutions. Smith’s winning project involved the development of a software tool, which analyses complicated software applications as they are running, to discover the relations between their components. Results are arranged in an infographic, demonstrating the interactions in real time, enabling the user to view how the application works. Alistair graduated in Software Engineering from the Department of Computer and Information Sciences. He is now working as a software development engineer at Amazon’s Development Centre in Edinburgh. Professor Ian Ruthven, head of the University’s Department of Computer and Information Sciences, said: “We are delighted with Alistair’s success in winning this award. Computer and Information Sciences at Strathclyde has a long-standing reputation for producing talented software engineers and Alistair’s award is recognition of this. For his project (Dacca: Software Design Maps using Dynamic Information), Alistair was presented with a cheque for £1500 which he says will go towards recovering from his recent move to Edinburgh and a trip to visit his fiancée in America over Christmas. Posted in News and tagged Alistair Smith, Amor Group, Engineering, ScotlandIS, Software, strathclyde. Bookmark the permalink.